The second IPF Annual Conference took place on Wednesday, June 29th , 2011. The Indian Philanthropy Forum's annual event in Mumbai witnessed leading philanthropists and inspirational social sector practitioners coming together with consultants and government representatives to create dialogue around key social issues in India. The conference explored how, through innovation, collaboration and partnerships, we can create long term solutions to tackle many of the country's pressing social and environmental challenges. Both in India and globally there is growing awareness that now is the time for India to build a strong and engaged philanthropic sector. This year's conference offered great insights, wide-ranging viewpoints and practical steps to help strengthen this movement, create action and move more people in India out of poverty faster. Throughout the day discussions focused on a range of topics including child malnourishment, impact investing and the state of Indian philanthropy. Over 300,000 people die from TB in India every year. There is a dire need for an innovative and affordable solution that can shorten treatment time and be available easily in rural India. The IPF audience joins a thought-provoking discussion about this deadly disease and ways it can be combated. In India, 3,000 children under the age of three die every day due to malnutrition. While this poses as a huge problem for urban India, the healthcare of the most vulnerable children in the slums is seldom discussed. 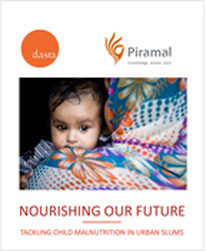 Nourishing our Future is the result of a four month research process into the issues and challenges surrounding child health and nutrition in India’s urban slum populations. The report identifies the five cornerstones of preventative and curative care and analyzes the interventions of 10 non profit organizations working to scale solutions in Mumbai and New Delhi’s slums. Bain & Company released its India Philanthropy Report 2011 at Dasra’s Indian Philanthropy Forum on June 29, 2011. The report takes an analytical and data-driven look at the giving landscape in the country, the current philanthropic trends, and future imperatives. Based on a survey of around 300 High Net Worth Individuals (HNIs), along with interviews of philanthropists and NGOs, this report discusses the evolution of Indian philanthropy in the context of the rapid growth of the country’s economy. The report, authored by Arpan Sheth (Partner, Bain & Company, Mumbai) and Madhur Singhal (Manager, Bain & Company, New Delhi), is intended to contribute to an informed debate on giving in India. Barclays Wealth launched their report 'Tomorrow's Philanthropist'. The other reports that were presented at the event were 'Philanthropology' and 'Barriers to Giving'. These reports give an insight into the state of philanthropy and the challenges faced by various sectors and practitioners.